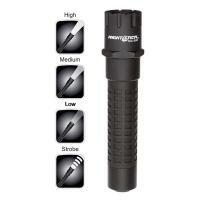 The Nightstick TAC-500 is a rechargeable LED Tactical Polymer Multi-function Flashlight that has 3 microprocessor-controlled brightness modes as well as a strobe function. With a CREE LED rated at 200 lumens and its high-efficiency deep parabolic reflector, the TAC-500s beam has an effective range of 210 meters (over 688 feet). Its waterproof design in combination with its impact and chemical resistant glass-filled nylon polymer housing, make the TAC-500 one of the toughest tactical lights around. The large tail-cap switch provides momentary or constant-on plus a user selectable set of 3 brightness settings and disorienting strobe. Running on a Lithium-ion rechargeable battery, the TAC-500 is rated at 3 hours of run-time.